Noisy and vibrant, Piazza Navona is the hub of artistic and commercial activity in this part of the city. Known for its Baroque architecture, alfresco restaurants, ornate fountains, and street artists, the square attracts visitors from around the world. The centerpiece is an elaborate fountain--representing the rivers Nile, Ganges, Danube, and Plate-- created by Baroque sculptor Gianlorenzo Bernini. A massive, ancient obelisk tops the fountain. Artists Giacomo della Porta and Antonio della Bitta sculpted the two smaller fountains here. The plaza was built in the first century on the site of a former arena where ancient Romans came to watch various competitions. 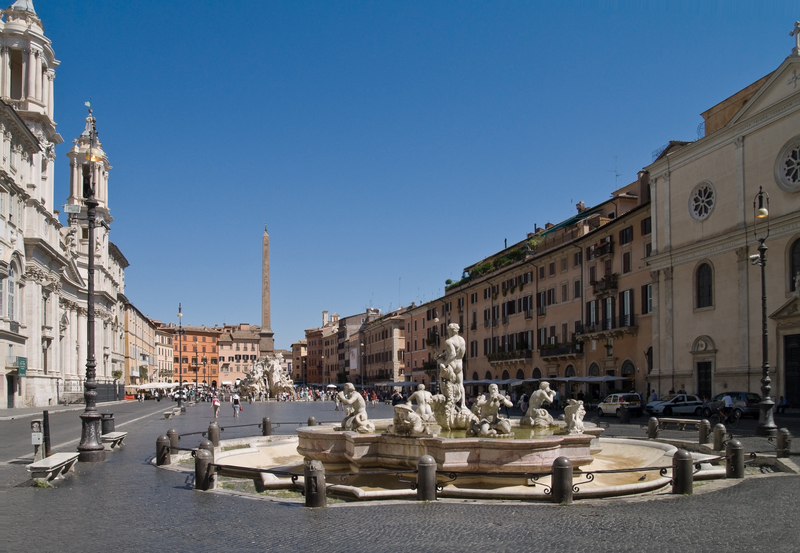 Use our Rome trip maker to add Piazza Navona and other attractions to your Rome vacation plans. One of the things that you can't see when understood in Rome. Between stores, views is a cheese and pepper you with ago na photo Piazza Navona? We went at night! Beauty... the 3 sources with the Church of Santa Inés of agony in front is a great place. We had dinner opposite the fountain of the 4 rivers by Bernini... impeccable! This is a cool place to check out when in Rome. There is a lot of cool thing happening in the Piazza. When we were here there was local bands playing and lots of people sitting around having a drinks and good time. On the weekends in the late afternoon/evening you will find many artists gathering here and selling their paintings (I did not find any canvas paintings anywhere else in Rome). We bought two beautiful paintings here (1 - Spanish steps; 2 - St Peters Basilica + Bridge of Angels). The selection is good, there are many others. Worth the visit. I think it’s the most important square in Rome. One of the best examples of baroque architecture. You can find a lot of attractions there. The famous fountains, museums, churches, etc. Don’t miss the opportunity to enjoy it. Just have a drink or meal in one of those restaurants and cafes there. Even the food is not that good but you will feel the atmosphere. I would spend there the whole day! Enjoyable Piazza. Has plenty of restaurants (not inexpensive). If you enjoy art, you might find something for you here. From portraits, caricatures, landscapes. There are many artist available to show their paintings to you. There are a few nice fountains to. Gets busy, but not too busy that you cannot move around freely. Always a pleasure venue. When there 18 years ago the church was covered in scaffolding during its restoration. Wow, so beautiful now. Almost every day I walked through on my daily walk. Lots of room to move about. At the North end, turn left and see the underground display of what the plaza originally was. A beautiful Plaza with fountains down the middle and restaurants lining the sides. It's lovely to sit here and people watch, or just admire the scenery. If looking for food I'd recommend walking slightly away from the Plaza to avoid any tourist traps. Although, to be fair, most of the food around this area is nice, it just depends on how much you are paying for it. Every day, we help thousands of travelers plan great vacations. Here are some tips on how to use your Listing Page to attract more travelers to your business - Piazza Navona. Promote your permanent link - https://www.inspirock.com/italy/rome/piazza-navona-a87225967 - on your website, your blog, and social media. When a traveler builds a plan from this page, the itinerary automatically includes Piazza Navona. This is a great way for travelers looking for a great vacation in your city or country to also experience Piazza Navona. Promoting your link also lets your audience know that you are featured on a rapidly growing travel site. In addition, the more this page is used, the more we will promote Piazza Navona to other Inspirock users. For best results, use the customized Trip Planning Widget for Piazza Navona on your website. It has all the advantages mentioned above, plus users to your site can conveniently access it directly on your site. Visitors to your site will appreciate you offering them help with planning their vacation. Setting this up takes just a few minutes - Click here for instructions.